→Revitive Reviews : Does It Really Works As a Pain Reliever? Revitive Reviews : Does It Really Works As a Pain Reliever? Revitive is a medical device which claims to improve circulation, relieve pain, reduce tired feet and strengthen leg muscle weakness. Their manufacturing company claims that Revitive uses electrical muscle stimulation, they have also stated that this Revitive been clinically proven to work. 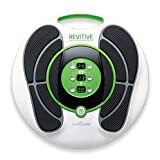 Revitive as seen on Tv, help you to sit and relax your feet in just 20-30 minutes a day.Read our detailed revitive reviews 2019 below. You can also read revitive reviews on Amazon. There are many people who suffer from discomfort in their feet and legs. Often the problem occurs due to poor blood circulation and this is best for those who have osteoarthritis or diabetes problem. Revitive Medic may be a solution to help with these problems. Revitive is a circularly designed appliance which use electric muscle stimulation (EMS) to stimulate thousands of nerve of the foot. 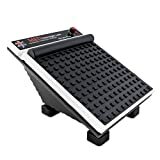 The manufacturing company claims that by using this your foot muscles relax and start a pumping action, which helps to increase blood circulation in the foot. Revitive is claimed to have 99 levels of intensity, that means it is very powerful for everyone. But the device is dangerous for certain people (like those with pacemakers, pregnant women, and deep vein thrombosis) should not use it. Actegy its manufacturing company claims that in the recent clinical study showed Revitive is able to increase blood circulation by over 50%. To use Revitive, As per their instruction all you have to do is just sit down, put your feet on the foot pads of the device, and plug in the device. Now, adjust the levels until you start to feel your muscles contracting. Then, sit and relax for 20-30 minutes as Revitive increases blood flow and reduces pain. Revitive is the device which increases blood circulation in your feet and legs by use of a mild electrical pulse. Electrical pulse stimulates nerve endings and promotes blood flow to the area. Revitive is very simple to use. You just have to plug it in, next set the intensity level, and place your feet on the unit. The devices come with a remote control which helps you to operate the apparatus without bending over to touch it. The intensity settings range from 1 to 99. But you should start from the low end and increase the intensity until you find a setting that works perfectly for you. We have also heard that some users are saying that they can not tolerate it above 30. While some other also said that even the highest level was not working for them. 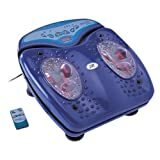 While using the apparatus, you may feel the muscles in your legs and feet twitch or tingle. Although you may not feel it instantly. Sensation and Tolerance are highly subjective. At first, sensation may be strange, but it is not painful or unpleasant. One feature which is only the best one is its TENS(Transcutaneous Electrical Nerve Stimulations) electrode body pads, which helps you to target other areas of the body as well such as the knee, back or shoulder. Those who are suffering from pain in those areas can get some relief by using these electric pads during their treatment sessions. Some people may confuse about: Is this a TENS device or an EMS machine? Then the answer is that it is both. You can also read our Copper Fit Reviews if you are suffering from joint pain, fatigue or soreness in the muscles. Before purchasing this product, please consult your doctor if it is suitable for you. Revitive is overall getting the positive response from its users. This product seems to be more known in the UK. Have you tried this Revitive? Please give it a star rating and share your comment below. You can give it a try if you are suffering from pain. I hope this Revitive Reviews 2019 help you to understand about this product. You can also read customers Revitive Reviews on Amazon. If you are also suffering from discomfort in your feet and legs then you should give a try to this Revitive medic.